← The Lufbery Legacy Lives On! 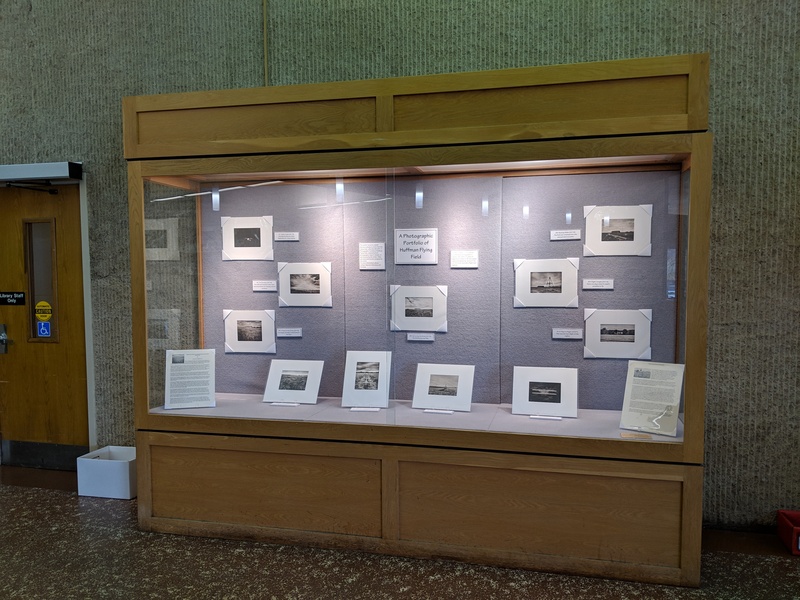 New Collection Now on Exhibit: A Photographic Portfolio of Huffman Flying Field by Lloyd A. Greene, Jr.
We are pleased to share that a new collection received and processed earlier this year is now on exhibit in the lobby of Dunbar Library. The exhibit features original platinum palladium prints from the manuscript collection MS-631: A Photographic Portfolio of Huffman Flying Field, created by local photographer Lloyd A. Greene, Jr. and donated by the artist. Greene is a fine art documentary photographer in Dayton, Ohio, with 20 years of experience. Earlier in life, he studied chemical engineering, served in the U.S. Air Force, and was a flight test engineer. Huffman Prairie, now part of the Dayton Aviation Heritage National Historic Park, is where the Wright Brothers mastered controlled, powered flight, and tweaked their invention to the point of being the first practical, dependable, predictable (i.e., truly controlled) airplane. In addition to a testing ground, the Wrights later used Huffman Prairie as the site of their flying school as well. A number of historic photos of Huffman Prairie from MS-1: Wright Brothers Collection are also available online in CORE Scholar, and a few originals are on exhibit in the Special Collections and Archives reading room. This entry was posted in Collections, Exhibits, Local History, Wright Brothers and tagged exhibits, MS-1, MS-631, new collections, outreach, Wright Brothers. Bookmark the permalink.